Global Dialogues Fellowship 2018 Opening Reception & Pierogi Party! 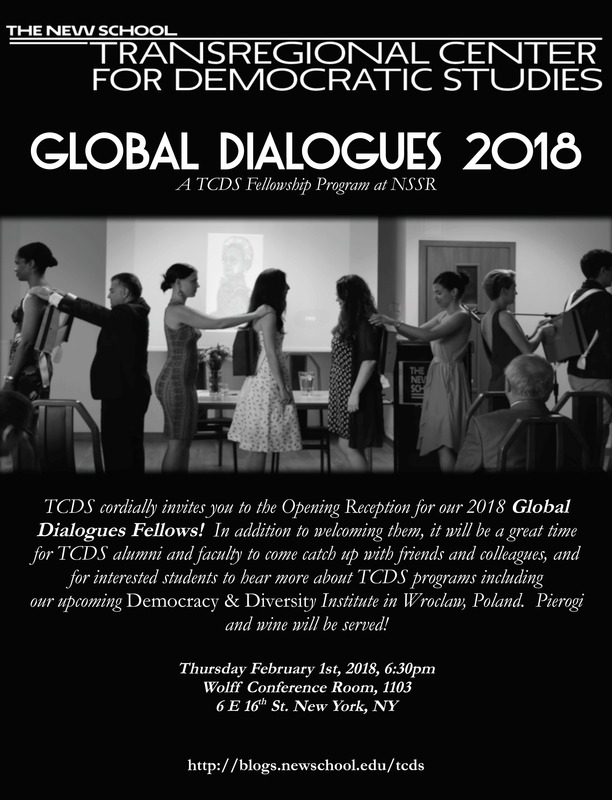 TCDS cordially invites you to the Opening Reception for our 2018 Global Dialogues Fellows! In addition to welcoming them, it will be a great time for TCDS alumni and faculty to come catch up with friends and colleagues, and for interested students to hear more about TCDS programs including our upcoming Democracy & Diversity Institute in Wroclaw, Poland. Pierogi and wine will be served! Let us know you’re coming on Facebook here! ← Full Program Information and Applications now available for 27th annual democracy & Diversity Institute, Wroclaw, Poland, July 6-22, 2018!